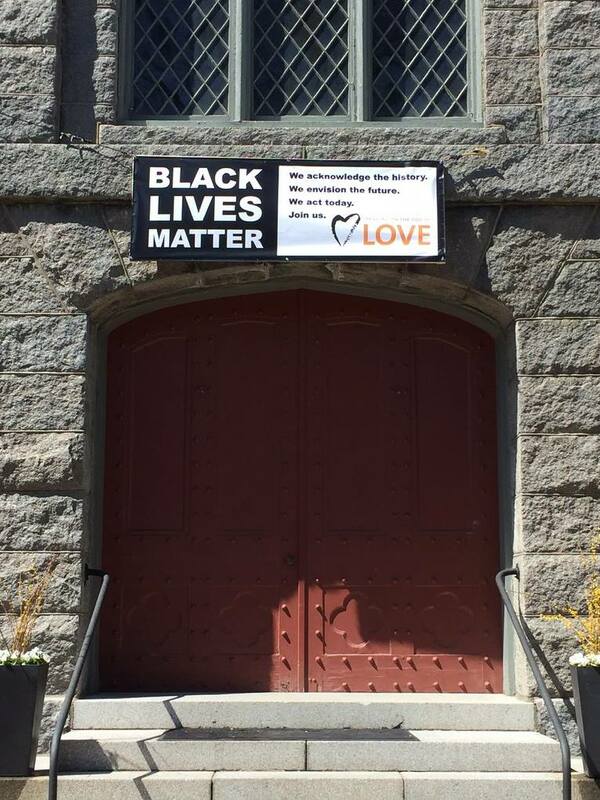 Why is a mainly "white" New England congregation hanging up a "Black Lives Matter" banner? Over the last year and a half our congregation has hosted a series of discussion programs about "Race in America." We have watched TED Talks and read books about the disproportionate number of people of color incarcerated in our country’s prisons. We monitor the reports about the ongoing cases of police violence, (even as we recognize that most police officers are decent individuals trying to enforce the law). We have hosted book groups and heard from different members of our congregation, both white and black, about their experience of race here on the North Shore. And we have acknowledged the reality that we live in a community that is still mainly segregated by race and class through no fault of anyone in particular but rather the result of social and economic pressures combined with racial bias that is often unconscious. We also recognize the reality of our community here: like many Unitarian Universalist congregations, we are a mainly “white” or European American, middle and upper middle class church. We do not consider any of this controversial or disputable since we are naming and describing our experience and reality as a people living in a historic, working-class, small city here in New England. It is clear that far too often there exists two standards of law enforcement depending your neighborhood, and the color of your skin. This is a truth that has been the case for a very long time for anyone who has been willing to listen and observe. It is also clear that we live in a society where too many people of color are unfairly targeted by law enforcement and discriminated against by employers and retailers and other segments of society. Racial bias, both conscious and unconscious, is still very much a part of our society. As a congregation we want to do more than just acknowledge our current situation and what we see around us. We aspire to be part of a larger dialogue about the state of race in this country and in this region, as a people of faith and as a historic and well-known congregation that is (in)famous for our intolerance and bigotry over 300 years ago. We have learned the lessons of our tragic history. Over the last 240 years especially, this church has found ways to reach out to different groups with the hope of making a difference and fostering equity. In the 1790’s, for example, it was members of this congregation under the leadership of the Rev. William Bentley, who first welcomed Catholic immigrants to this town and area, something that was controversial at the time. Later members of this congregation fought to abolish slavery and supported the local African American merchant community that thrived here in Salem during the middle part of the 19th century. So we hang this banner above our front door as an act of faith, as an act of hope, and out of a growing understanding of the historic and current experiences of African Americans and "people of color" in this country. We also hang up this banner out of sense of kinship and friendship. Many of us are related through blood and marriage to people whom other people would identify as another race. This is not just about fostering and supporting a very important larger discussion about race in this country: it’s about our family and friends. It’s personal. These are challenges that some of us have grappled with in our own lives. Discrimination and racial prejudice doesn’t just affect other people, it affects in some instances us, and people we know and love. Our vision for Salem and our church is that we become an energetic, multi-ethnic community in the years and decades ahead – a place where people from diverse backgrounds can come together and be in community. That is part of what we do here in a religious community – we gather together – we walk together – to use the language of our church's old covenant – and then we look for ways to grow and inspire and stretch our souls together. The youngest generation of Americans may be in a position to lead a vital national discussion about the pervasive role that race and class still undeniably play in American life. We believe that we all have a part to play in this larger conversation. So we hoist up this banner as a way to encourage these conversations, and foster these connections, knowing that we will not always have easy answers but we are willing to listen and share, and listen and learn, with the goal of moving towards that "more perfect union," as envisioned in this country's Constitution.